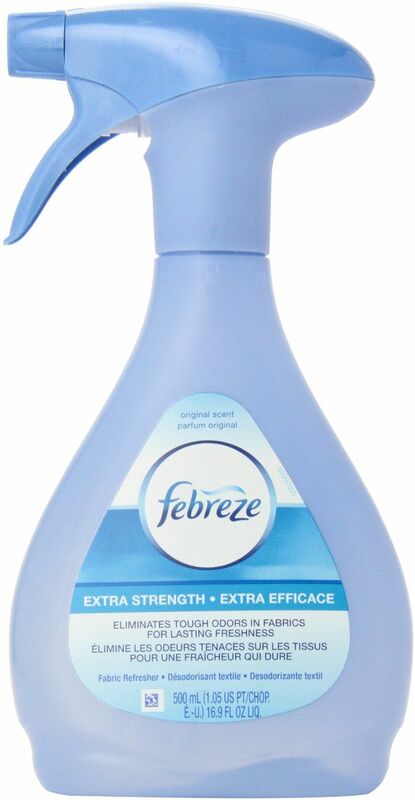 Febreze is a light and airy spray refresher that can be used on carpets, bedding, clothing, upholstery, rugs, and more. It works well in the home or car. No matter where you find musty or smelly fabric, Febreze can eliminate the odors quickly without leaving a heavy residue of its scent. This spray is a different type of product than a typical air freshener since it is designed to help with fabric odors. This product sprays out a mist of liquid that settles into the fabric and then dries. Due to this, the product isn't a good idea for fabric types that spot with water like silk and satin. Febreze is safe for nearly all fabric surfaces except for some delicate surfaces that don't do well with water spots. You can test the product on an inner hidden seam to get an idea of how the fabric reacts. Odors fade away as the Febreze dries. There isn't a ton of scent left from the product, either. You're left without any bad odors and just a hint of the product. It is great for those who don't like heavy scents. Febreze comes in several pleasing scents and creates new seasonal scents regularly. There is sure to be something that you and your family will enjoy whether it would be tropical, floral, or clean scents. Febreze should be tested first on fabrics that may water spot. To test and save yourself the trouble, just lightly spray a hidden inner seam to see how the fabric reacts. Spray this product evenly and at a good distance. This isn't so important for upholstery or carpets, but vital for clothing. You want the clothing or fabric to be at a distance of at least an arm's length. Start with a little. Allow the fabric to completely dry before wearing it, walking on it, or sitting on it. Depending on how much you sprayed, this could take 2 minutes to 20 minutes if you drenched it. Be sure not to spray too much. It makes the drying time ridiculous. Smell the freshness that remains. Odors should be gone now. There are many scents and formulas available including a pet odor and sleep formulas. Febreze is easy to use. Spray it on your fabric and odors disappear. Febreze works well without added side effects like an overbearing smell or skin allergies. You can use Febreze in closets, on carpets, on beds and mattresses, on clothing, and in the car. Febreze saves you time and energy. If the carpet doesn't need to be shampooed, and the upholstery isn't ready to be cleaned, It can help refresh and renew without all the extra work.